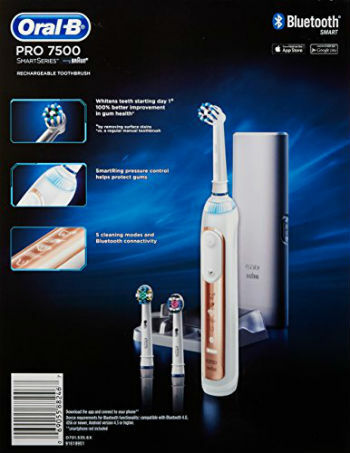 The Oral-B Pro 7500 is one of the more advanced, and therefore, more expensive, electric toothbrushes on the market. It comes packed with features and an interactive app. But, does that mean it is worth the money? Find out in our review below. I’m always on the lookout for new devices for personal oral hygiene. Surely technology—that benefits my work life—should benefit this important part of my daily schedule too? 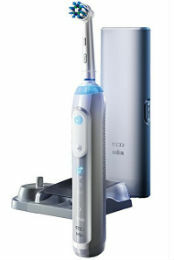 That’s why I tried the uber modern Oral B Pro 7500 and I want to share my findings with you. Did Oral B go overboard installing features with this Bluetooth enabled toothbrush? Perhaps. But let’s look at all of it so you can see if this should be in your bathroom from now on. Is it still in mine? Let’s find out. 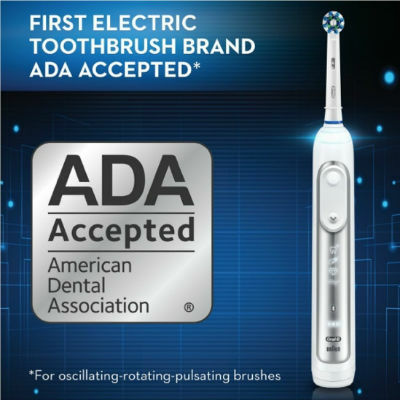 READ MORE: Electric toothbrushes that are worth your money! First of all, be prepared for the price tag. This is a state of the art device and a high-end toothbrush so you are going to pay a little more for this than the usual ones you purchase at the grocery store. Don’t worry. The Pro 7500 still looks like a toothbrush. It’s a sleek plastic encased unit with many flashing lights. And these lights are what the fuss is about, which we’ll discuss below. I appreciate that the designers kept in mind that I like my bathroom neat. The handle doesn’t lie around loose, but slots into the charger and there’s space for your different brush heads. I loved the rubber on the handle as it gave me a firm grip and even in my kids’ hands it won’t slip. And of course it’s waterproof, so you don’t have to fear the battery will get wet inside. All the features are driven by a strong lithium battery and a dependable motor, giving you a two-year guarantee. You can easily track the battery life since the LCD icon tells you when you’re low on power. The brush itself can contain data and transfer it to your Smartphone via Bluetooth. You simply have to download the Oral B app. I get warned when I press too hard on my gums. The SmartRing that shines red and the brush will even change power down for less impact on your gums. It’s interesting that the brush teaches me how to optimally care for my mouth. The brush heads are round. This allows me to clean each tooth individually. If you use the CrossAction brush head the bristles’ unique angles help clean your teeth up to 500% better than usual. If smoothness is anything to go by I can vouch for that. The brush signals every 30 seconds to tell you to switch to a different part of your mouth. Here’s what I don’t understand. All these modes are shown on the handle except for the Daily Mode. I would prefer icons for all settings so I know I picked the right one. The real-time feedback on how well I’m brushing. If you have specific oral care concerns these features can be dynamic. I can imagine if you receive certain tips from your dentist and you can program your toothbrush to guide you in following these directions, these features make sense. You can even provide reports so your dentist can help make adjustments to your brushing techniques. I am impressed by the toothbrush’s performance. The battery is powerful enough to give me almost an hour’s usage. This means it’s practical even if the entire family needs to use it within a short time frame. No charging will be necessary in between. What doesn’t perform well is the Bluetooth connection. You must be really close to the brush for it to connect and transfer data, so you must bring your Smartphone into the room if you want it to work. 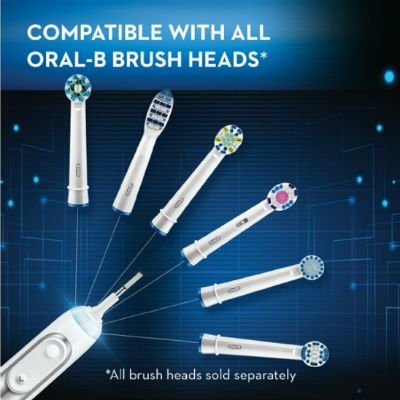 The brand does the smart thing by making this unit compatible with all Oral B brush heads. This counters some unnecessary costs if you like the flashy toothbrush but still have stock of your old one’s heads. I enjoy the brush heads because they really clean my teeth. But after two weeks I realized I wasted money on features I will probably never use. It’s a novel idea, but only practical for a small niche. If you fit into that market, you’ll love it.